"A combination of roasting, then barbecuing with sauce, makes this pork a delicious Southern-style recipe. Takes some preparation but well worth it. Excellent for feeding a crowd!" Preheat oven to 350 degrees F (175 degrees C). Place roast in a 9x13 inch pan, sprinkle with garlic salt, and cover with foil. Bake in preheated oven for 3 to 4 hours, or until a meat thermometer inserted reads 145 degrees F (63 degrees C). Preheat an outdoor grill for high heat and lightly oil grate. Grill roast for 10 minutes on each side. Return roast to the pan, and shred the meat using two forks. Stir in barbecue sauce, and return to the oven for 20 minutes, or until heated through. Spoon meat onto buns. This was an okay recipe but I put mine in a crockpot for eight hours and then shed with two forks and pour the BBQ sauce over and mix. This way you just walk away from it. 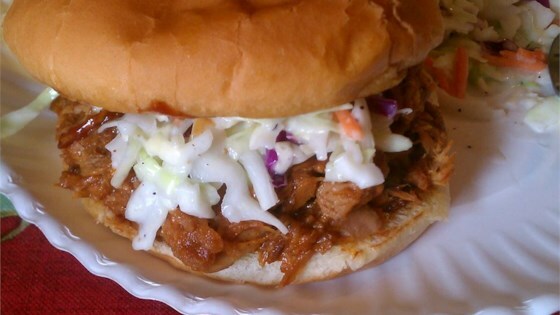 use your favorite bar b q sauce and this will melt in your mouth. I make the roast and serve it as such, then use the left overs for the sandwiches. I make my own sauce as well but the idea is brilliant for left overs even chicken and beef. followed almost exactly. I trimmed alll the visible fat, slow cooked it for 8 hours, then pan fried it in a little of its own fat , then I added S.B.rays bbq sauce. Delicioso!